Bird Box (film, 2018). A 2018 American post-apocalyptic horror thriller film with "R" rating by Netflix. Directed by Susanne Bier. Official Trailer. Bird Box is a 2018 American post-apocalyptic horror thriller film directed by Susanne Bier. 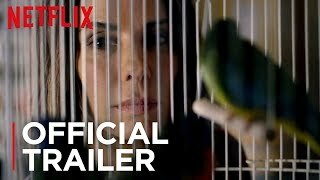 Bird Box | Official Trailer #2 | Netflix. In a post-apocalyptic Northern California, a woman (Sandra Bullock) tells a boy and a girl (Julien Edwards and Vivien Lyra Blair) that the three of them are going on a long journey down a river on a boat. She explicitly warns them not to remove the blindfolds they will be wearing, because if they do, they will die. Five years earlier, the woman, Malorie Hayes, is very pregnant and living alone, and is visited by her sister Jess (Sarah Paulson), coming to pick her up for a routine check-up with gynaecologist Dr. Lapham (Parminder Nagra). As Malorie gets ready, Jess turns on the T.V. to show her news reports of mass suicides occurring throughout Europe, but they dismiss the severity of the reports and go on their way. At the hospital, Malorie walks past a woman talking on her phone who briefly looks at something outside. When her appointment is finished, Malorie passes by the same woman who is now causing a panic by banging her head against the windows, breaking the glass and causing injury to herself as hospital staff try to restrain her. Realizing that the strange occurrences in Europe have now reached North America, Malorie rushes back to Jess' vehicle and urges her to leave, telling her that what's happening in Europe is now happening there. As they are driving, Malorie and Jess consider what to do as panic begins to spread in the streets, and Jess' cell phone rings in her purse in the back seat. When Malorie turns around to reach for it, Jess sees something that frightens her, and she begins to drive erratically, causing them to crash in a rollover accident. They crawl out of the wreckage. As Malorie continues to struggle to get out of the vehicle, Jess, severely affected by what she has seen, steps into the path of an oncoming truck, killing herself. Malorie, in a state of shock and confusion, finds herself running with the crowds, the panic now having escalated to a mass hysteria. Principal photography began in California in October 2017. The film Bird Box was scheduled to be released by Netflix on November 12, 2018 (AFI Fest), on December 14, 2018 (United States) and on December 21, 2018 (United States). The duration of the film is 124 minutes. The film's budget is $19.8 million. Bird Box got high rating from critics. The audience also likes the film.